At the Albany PO Monday afternoon. This time of year, waiting in line at the Albany Post Office tends to take longer, presumably because of the pre-Christmas rush. I’m wondering why the Postal Service does not make things easier for the public by giving contract offices the authority to handle more of the load. 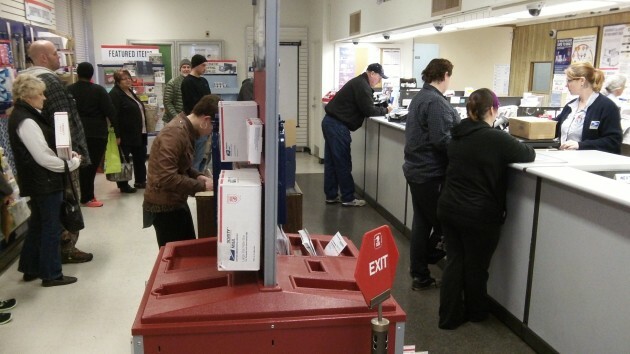 On Monday, the line at the contract post office in the Carriage House Plaza was short and moving swiftly. But the office cannot handle packages going abroad. It has extremely helpful clerks, though, and one of them explained that I could go online to complete all the necessary customs paperwork and payment of the postage. She even weighed the items I wanted to send so I would know what weight to put on the form. Another customer also could not complete her transaction (I don’t know what it was) and learned she would have to go to the post office downtown. There may be reasons for this, but I wonder how valid they are. For instance, it is because of security concerns, I was told, that only regular post offices are allowed to enter the relevant computer information regarding international packages. If that’s true, it sounds to me like a poor reason where mailing Christmas packages is concerned. 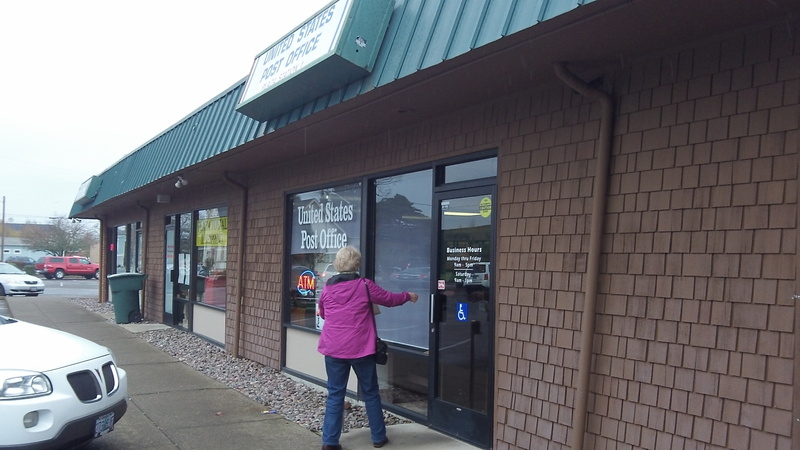 A customer enters the Carriage House Plaza postal station. You have to remember these rules are made by the Post Office to try to keep workers on the payroll. They hate contract Post Offices because they’re constantly being shown up when it comes to customer service. And as for requiring the highest integrity in their workers? It wasn’t that long ago that KATU and other TV stations ran the story about the postal worker in Portland that defecated in a person’s yard and even with the photos of him “in the act” it wasn’t enough to get him fired. But in their defense, they did move him to another route. I guess they figured he had “marked” that route well enough. But yes, if they are trusted to handle the mail, they should be allowed to handle all the mail. It’s good to know there’s only ONE reason I should ever need to go to the main post office lobby. I have avoided that place like the plague for decades. When I need to send a package to my overseas relatives I am relegated to postal purgatory. I mirror Hasso’s sentiments regarding the Carriage House post office. Helpful, friendly, no lines, quiet…….close to home……..as close to postal heaven as you can get in this town. My experiences with the downtown post office are generally great. It is busier at certain times, but they always provide excellent service. I try to avoid the early morning and late afternoon rush when possible. The service they provide is not replicable by either UPS or Fedex. The cost of the latter two being prohibitive for many items. I don’t know too much about the contract offices, but I work in a business that has to ensure that packages are always controlled and secured (ie locked up). Due to this requirement, we cannot use UPS or Fedex (or presumably contract offices) as they can not guarantee this for our business.